3/4 c. chopped cilantro and pulse until just mixed. It’s very good and I use it to dip raw veggies into as well. 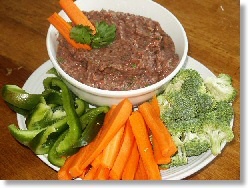 I’m a tortilla chip-aholic and love to dip raw carrots in this for the same crunch.